A public service announcement from the Skylark Lounge. The Skylark Lounge wants people on bikes to know two things: The South Broadway bar loves bikes, and also don’t bike on South Broadway. A Streetsblog reader sent this unfortunate poster our way after seeing it in the Skylark’s window. It appears to be a plea for people on bikes to steer away from the two-way, parking-protected Broadway bike lane that takes people to the business’s front door. The Skylark is at Broadway and Maple, where a driver jumped the curb and crashed through the bar’s front door in 2014, narrowly missing a patron on the patio. Reps from Skylark did not return a call from Streetsblog. 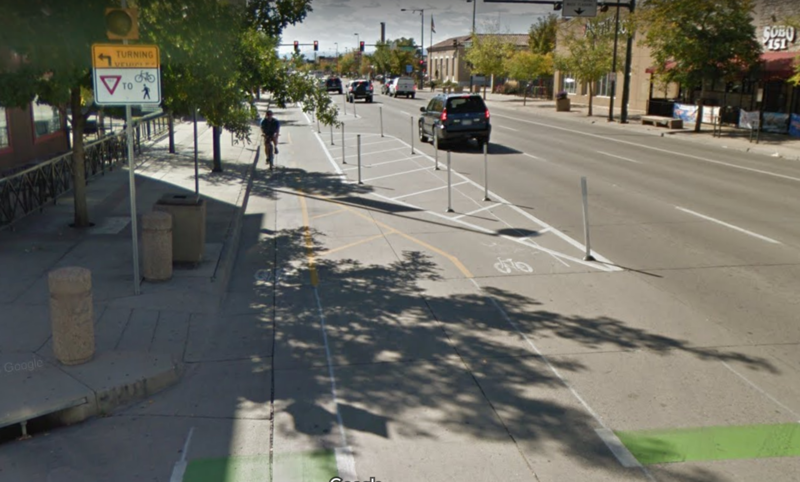 By narrowing the right-of-way for motor vehicles, the bikeway installed by Denver Public Works reduces the prevalence of dangerous speeding and makes the whole street safer. There’s also a blinking yellow light and a large sign telling drivers turning left off Broadway to yield to people walking and biking. The intersection is inarguably safer than it was without the bike lane. If Skylark’s managers truly love bikes and the people who ride them, they should welcome this vast improvement for bicycling safety on what used to be a surface highway. “Safer” is relative – both design and traffic volumes matter, and only 20/20 hindsight (aka actual experience, statistics) will give the real answer!